Celebrate National Kidney Month by taking the National Kidney Foundation of Maryland’s (NKF-MD) free Kidney Health Risk Assessment to identify if you’re an adult at risk for chronic kidney disease. The assessment uses a simple Body Mass Index (BMI) calculation, blood pressure measurement and a short six-question questionnaire to make participants aware of their risk factors for chronic kidney disease. Participants will receive brief consultations with physicians and dietitians to learn about kidney disease, as well as general nutrition and wellness guidelines. Individuals not at risk will be given educational materials about maintaining good health, while those at risk will be directed to further screenings and advised to talk to medical professionals. Those at risk are encouraged to follow up with their physician and to maintain regular primary care visits. Kidney disease is the 9th leading cause of death in the United States, killing more people every year than breast or prostate cancer. While 26 million Americans (1 in 9) live with chronic kidney disease, most don’t know it. In fact, 25 percent of the 1,170 people screened in 2016 by NKF-MD demonstrated significant results. Serving central and western Maryland, the Delmarva Peninsula and portions of Virginia and West Virginia, the National Kidney Foundation of Maryland is the area’s only voluntary health agency dedicated to preventing kidney and urinary tract diseases, improving the health and well-being of individuals and families affected by these diseases, and increasing the availability of all organs for transplantation. For more information, visit www.kidneymd.org. Wholehearted living is about embracing our tenderness and vulnerability as well as developing our knowledge and claiming our power. It’s about “engaging in our lives from a place of worthiness. It means cultivating courage, compassion, and connection,” according to Dr. Brown. Join Baltimore School of Music guitar faculty and students for our yearly guitar masterclass! This year, our guest teacher will be Troy King, who teaches classical guitar and guitar ensemble at Towson University. This class will take place in the Chapel at Second Presbyterian Church and is FREE and open to the public. Performers will be chosen by teacher recommendation from current students at Baltimore School of Music. Join Baltimore School of Music piano faculty and students for our yearly piano masterclass! 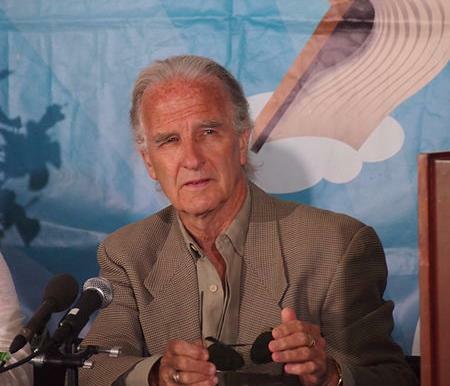 This year, our guest teacher will be Graham Yates, who runs Cypress Piano Studio near Huston, Texas. Starting the week of March 4, Boy Scout, Cub Scouts, Venturing Crew members and Girl Scouts in Howard County are going to be distributing a bag at your home asking for food donations (non-perishable, unexpired in non-glass containers). They will come back on Saturday, March 11, at 8 a.m. to collect your donation from where they left the bag. Feel free to use additional bags. The food will be delivered to one of 25 food pantries in the Howard County. The need is great, and we would appreciate your help in restocking the shelves of these food pantries as they get ready to serve local families through the spring and summer months. If we missed dropping off a bag, please feel free to still donate in your own bags. If your donation is not picked up, please email scoutingforfoodnpd@verizon.net and we will gladly come get it. Taking a stand against intimate partner violence has to be a deliberate decision. To authenticate the decision, it should be followed by clearly defined actions. What is or isn't "Taking A Stand?" What are appropriate steps to support your decision? On Wednesday, March 15th, join the Howard County Coalition to End Intimate Partner Violence as we explore these important questions and the actions we can take to effect change. The program is appropriate for all community members including faith-community leaders, individuals who work with youth and young adults, managers and human resource professionals, social workers, human-service professionals, educators and civic leaders. Thursday, March 23 at 7 p.m. The Urban Land Institute (ULI)*, descended on Ellicott City on January 11th and 12th like a gentle swat team. They interviewed hundreds of people in town and toured every building. In 48 hours, they presented their findings to a small crowd of stakeholders. Their insights and ideas were amazing. The ECP feels strongly that EVERY historic district property owner, business owner and resident should hear this presentation and learn about ULI recommendations for the future of Old Ellicott City. This meeting is specifically geared to residents living in the historic district area, but everyone is welcome. We are starting the meeting a little later, at 7 p.m., to allow residents to get home from work and then to the meeting. Drinks and desserts will be provided. Please RSVP to maureen@visitellicottcity.com or by calling 443-240-2060. 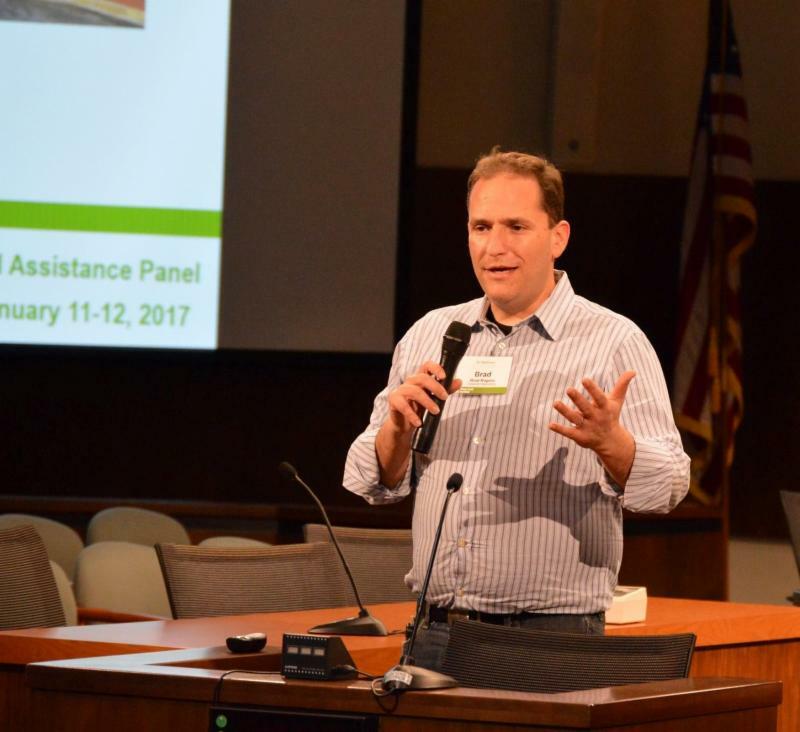 Brad Rogers will present the Urban Land Institute recommendations at a meeting on March 23 at 7 p.m.
Don' Have Time To Attend This Meeting? Watch It On The Web! If you missed the first two meetings, you should really try to attend the meeting on March 23. Brad Rogers does an amazing job of presenting the findings of the ULI experts who have worked on projects like National Harbor and Union Station. We strongly urge you to attend this meeting but if you can't, we have a link to a video recording of the presentation originally filmed on January 15, 2017 at the George Howard Building. Disclaimer: These recommendations are just that...recommendations. No decisions have been made concerning the future of Ellicott City. The County is engaging in a Master Plan process and community meetings will be held later in the year. Sign Up Today! Spaces are limited! 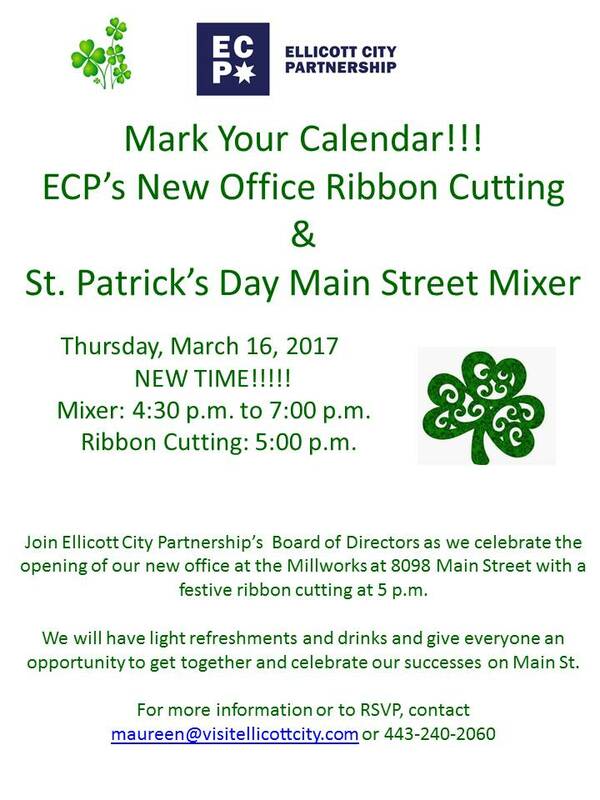 “EC UNITED" is the second in a series of “peer-to-peer dialogues” for Ellicott City Main Street businesses created by Garrett Glover, Small Business Development Center (SBDC) Retail Specialist and High Impact Consultant. The dialogue will be held on Wednesday, March 22, 2017 at the ECP office located at 8098 Main Street in the Millworks building. Garrett will outline and lead a discussion about a strategy by which Main Street merchants can work together as competitors and collaborators toward the betterment and ongoing economic development of EC’s historic commercial district. In doing so, Garrett will share insights gained from his work with current EC businesses and explain how this message -- basically “united we stand, divided we fall” -- could shape “dialogues” and programs to come. Of course ECP will have light refreshment and drink so you can come right after wok. Seating is limited to 25, so RSVP by calling 443-240-2060 or sending an e-mail to maureen@visitellicottcity.com. 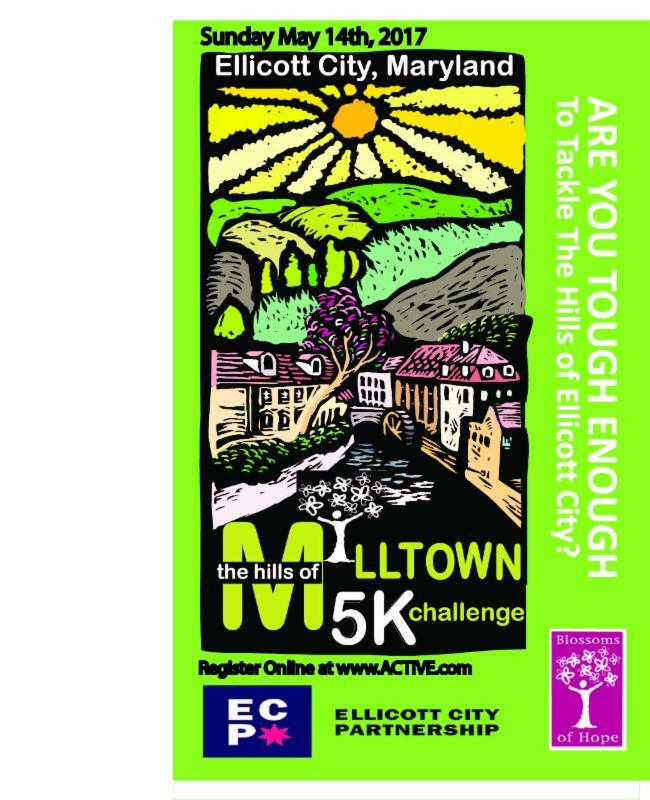 The streets of Ellicott City will be filled with runners on Sunday, May 14, Mother's Day, for the annual Hills of Milltown 5K Challenge. "Our goal this year is 200+ runners. ", states Ed Lilley, who is the hard working chair of this event and a member of ECP's Clean Green and Safe Committee. Proceeds from this race are distributed to Blossoms of Hope and the ECP Beautification fund. Sponsorships are still available. Each racer will receive a SWAG bag with coupons, brochures, and promotional items. Do you have items to promote your business for the bags like a coupon, flyer or other item? Contact Ed Lilley at 410-303-2959 and he will make arrangements to pick up. He can also tell you about sponsorship opportunities. Click here to view a map of the race or to view an application. Free Kids Crafts - We;ve added a new craft area on the B&O plaza. 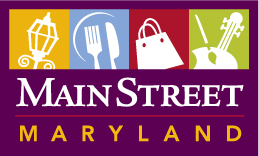 Main Street Ellicott City Businesses (brick and mortar stores) will get a $50 discount on above prices. Please read the rules carefully as you must have a certificate of insurance, food permit (if serving food) and a fire resistant tent. To view the rules and submit an application, click here. Have On The Lake in Columbia offered our displaced merchants free space at their holiday shopping event in December and merchants reported doing very, very well. They are hosting a spring shopping event on Thursday evening April 27, 2017 from 5-8 pm and are seeking businesses that would offer "Mother's Day" gifts, teacher appreciation gifts, graduation gifts, etc.. Spaces are $45 and you must of a certificate of insurance. Contact Karen Titus at 410-715-3025 if interested asap. Celebrate National Kidney Month by visiting the National Kidney Foundation of Maryland (NKF-MD) exhibit at the B’More Healthy Expo. As part of its mission of early detection and early intervention, NKF-MD will explain why the kidneys are important, discuss risk factors for kidney disease and give recommendations for protecting the kidneys. Visitors also can learn about and register for the 15th Annual Greater Baltimore Kidney Walk, taking place Sunday, Apr. 30, at UMBC. Kidney disease is the 9th leading cause of death in the United States, killing more people every year than breast or prostate cancer. While 26 million Americans (1 in 9) live with chronic kidney disease, most don’t know it. Men with kidney disease are more likely than women to progress to kidney failure. African Americans are 3½ times more likely to experience kidney failure and Hispanics are 1½ times more likely to experience kidney failure. For information about this event or NKF-MD’s other outreach events and kidney screenings throughout Maryland and Delaware, call 410.494.8545 or visit www.kidneymd.org. Time for the Ospreys to return to the Bay from their winter migration. Get the full scoop on these magnificent maritime raptors from veteran naturalist and eco rock star Greg Kearns at the Captain Avery Museum, Saturday, March 18, 1-3 pm. Free. Call 410-867-4486 to reserve your seat. The Columbia Pro Cantare chorus, now celebrating its 40th anniversary, will perform works by Eastern European composers, Sunday, March 19, 2017, 3 pm at First Evangelical Lutheran Church, 3604 Chatham Road, Ellicott City 21042. Joining the chorus, the Columbia Pro Cantare Chamber Singers and founder and conductor Frances Motyca Dawson for this concert will be guest soloists Laura Whittenberger, soprano, Rob McGinness, baritone, Jacqueline Pollauf, harp, and Donald Fries, organ. Works on the program include Dvorak’s Biblical Songs and Songs My Mother Taught Me, Kodaly’s Missa Brevis, Liszt’s Liebestraum No. 3 and works by Polish composers Zielenski and Moniuzko. Tickets are $20, $18 (students and senior citizens) in advance, $2 more at door. Children 5-15, $10. Order tickets online at www.procantare.org or by phone: 410.799.9321 or 301.854.0107. 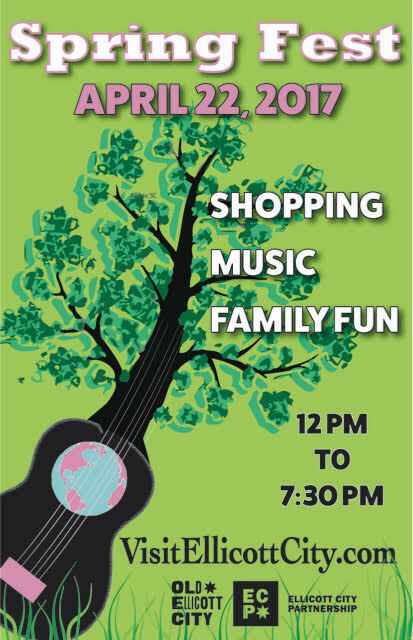 On Sunday, March 19th at 4:00 pm, join the members of the Hedge Band for an afternoon of authentic Irish tunes! This concert is presented by the Living Arts Concert Series, located at Resurrection Catholic Church (3315, Greencastle Rd, Burtonsville MD 20866). The Hedge Band was formed in 2005 by Laura Byrne, Donna Long, Pat Egan and Billy McComiskey, four of Maryland’s preeminent Irish traditional musicians. The musicians of the Hedge Band have performed independently at countless venues around the world including The Kennedy Center, The White House and Lincoln Center. They will be joined by dancers from the Culkin School of Traditional Irish Dance. A treat not to be missed! This concert is funded in part by a grant from the MSAC. No tickets required; a reception will follow the concert. For more information, pleae visit http://www.livingartsconcerts.com, or call Annick Kanter @ 301-520-8921. Please join us on Wednesday, March 22 for a fundraiser to support the GFWC Woman's Club of Laurel. Just come to the Chick-fil-A in Laurel (Contee Rd. and Rt 1 location) between 5:00 and 9:00pm, and bring your appetite! Please be sure to tell the cashier, inside or at the drive-thru, that you are there to support the club. Chick-fil-A will donate a generous portion of the proceeds to the Woman’s Club, who in turn will use that money to support local nonprofit and charitable organizations. Don’t miss this opportunity to enjoy some of the best fast food around while supporting a great cause! Please tell your friends and family, too. Hope to see you there! Collaborating with Southern High School for the third year in a row, Captain Avery Museum presents the opening of Emergent III on Sunday, March 26. This exhibition, curated by renowned portrait artist Michael Bell, showcases the regionally and nationally acclaimed artwork of student artists at Southern High. Celebrate the talent of local youth—artists and musicians—by joining us at the opening reception, 1-4 pm. The beloved, Tony Award-winning musical! The Morgan State University Department of Fine and Performing Arts presents this time-honored tale of hope, love and learning that: "there's no place like home." Presented as part of Morgan State University's Sesquicentennial celebration, this production promises to bring smiles and warm hearts to all who take the journey.